189 Maginhawa St. corner Makadios St. is a commercial building that is home to a number of restaurants. Jason and I took some time to try some food places located at the said establishment. 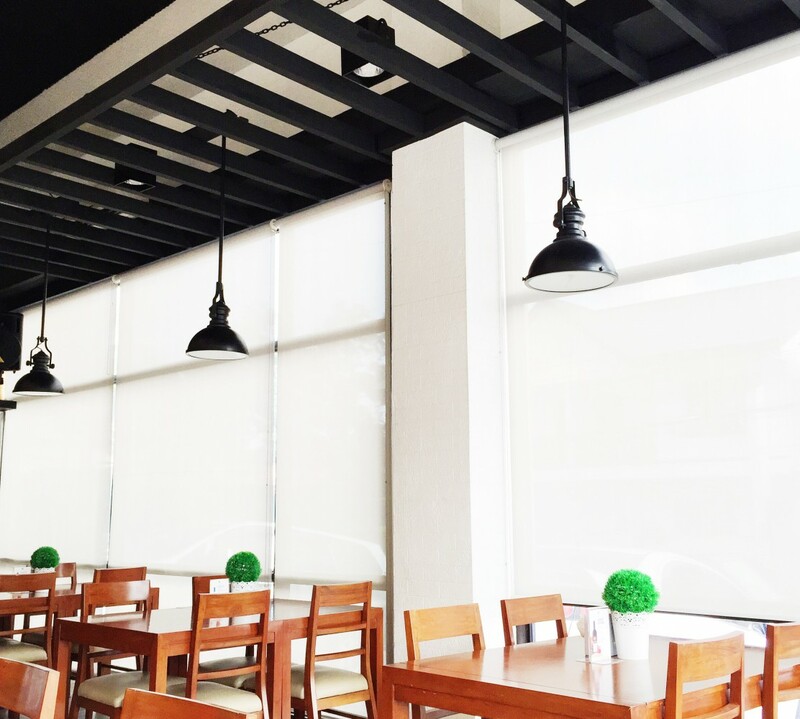 Via Antonella is one of the food places located at 189 Maginhawa. Upon entering, we were greeted by pleasant smiles and a very neat interior. 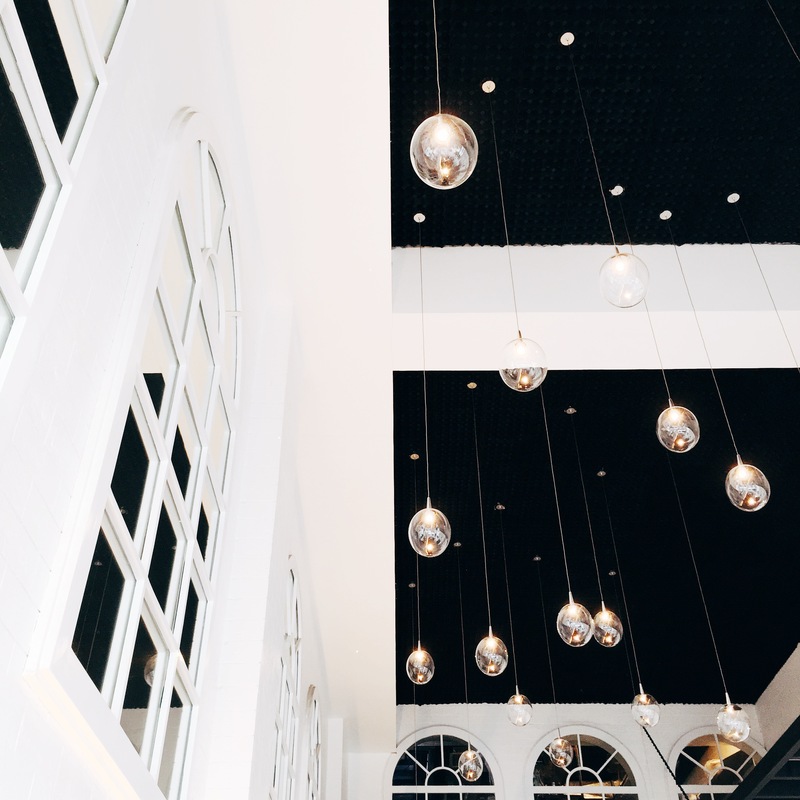 I could not help but stare up to what looked like big windows on the wall and the light bulbs hanging from the ceiling. As Jason and I sat, we were handed their menus, which we instantly browsed. We decided to order their Cream of Shiitake and Leeks, Pininyahang Roasted Chicken, and Steak and Mushrooms. It did not take long for our orders to be served and we immediately indulged. 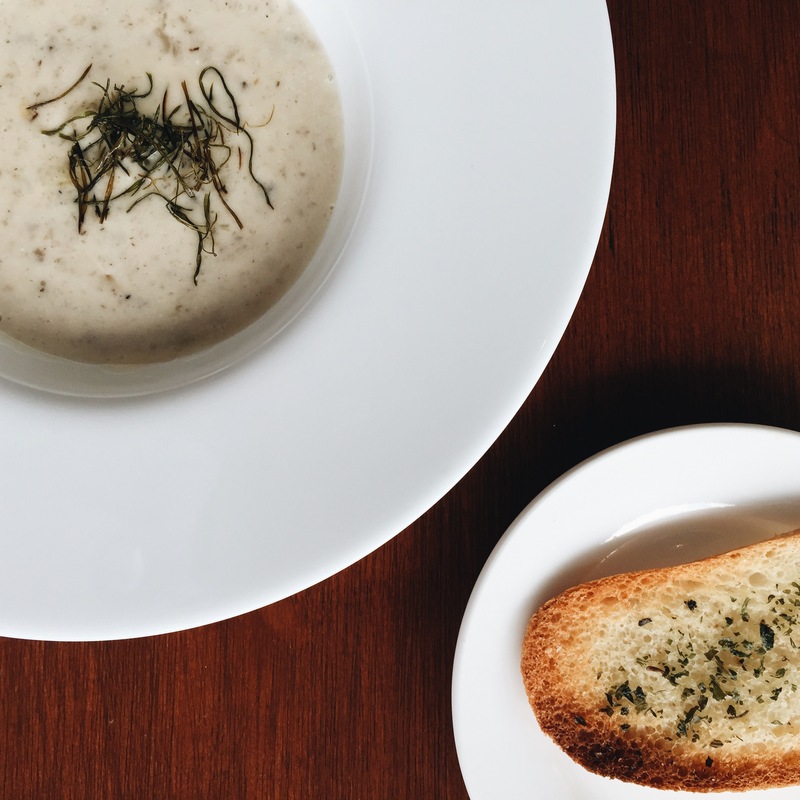 Their Cream of Shiitake and Leeks came with garlic bread and was so good! It was very rich and did not taste watery at all. Although the serving was small, it was enough to satisfy Jason’s then hungry tummy. 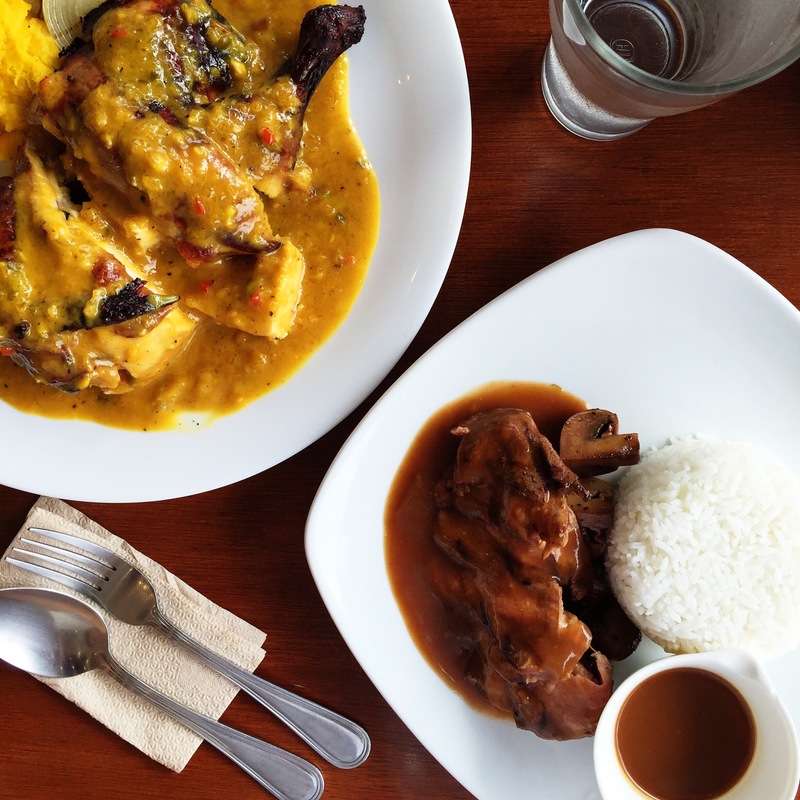 The Pininyahang Roasted Chicken came in next and we were delighted to see that the serving was huge. We actually did not expect it to be that big because we did not notice in the menu that it would be half a chicken! Nonetheless, we found it really good. After having been marinated in pineapple juice and mixed seasonings, there is no doubt that the chicken would not be flavorful. The meat was very tender and surprisingly, the chicken skin was not saggy. Jason found the sauce perfect and even said that it was like pineapple but not pineapple, which made it weird but still so good. As for the Steak and Mushrooms, it did not disappoint. The meat and mushroom ratio was actually equal unlike other restaurants that serve more mushrooms on their “steak and mushrooms”. The sauce was quite salty but it was still delightful. I would say that the serving was not small because it got me really full! Jason and I will definitely go back there and try their other house specials. Some might find the meals overpriced but from our experience, they were actually worth it. 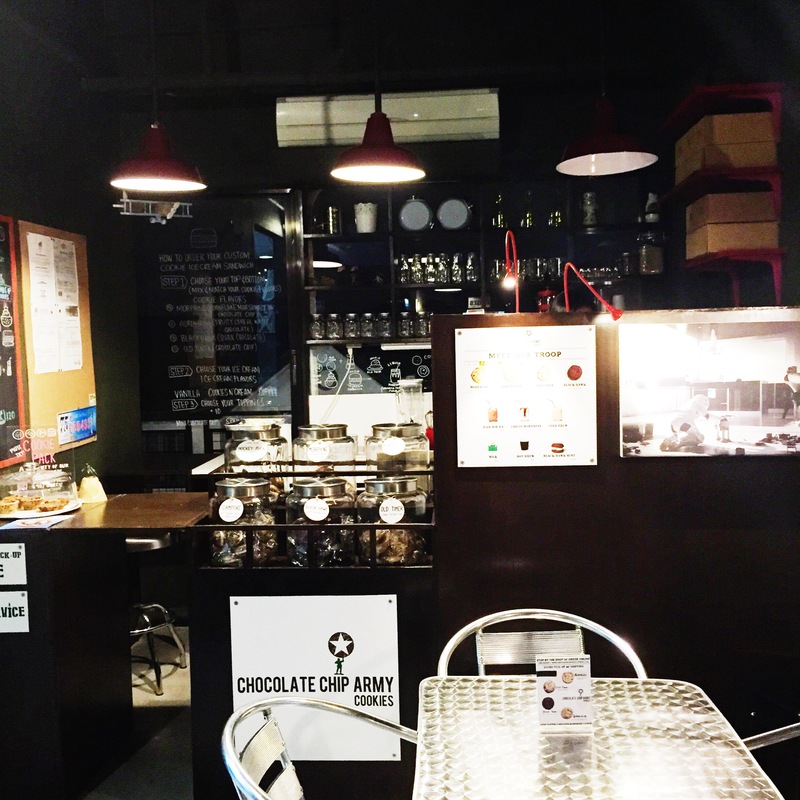 Wicked Kitchen is located in the second floor of the establishment in 189 Maginhawa and we visited the place to try their sinfully good desserts. They serve seven different desserts named after the seven deadly sins. Since Jason and I knew we could not try all seven in one sitting, we settled with Greed and Gluttony first. 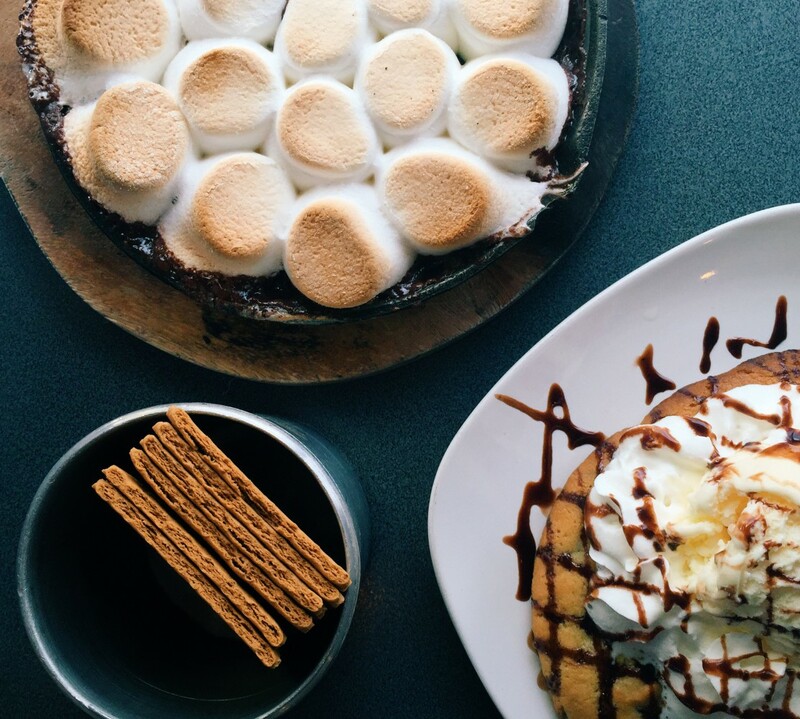 Greed was Wicked Kitchen’s skillet s’mores and I do not know how I am going to stress how good it was. 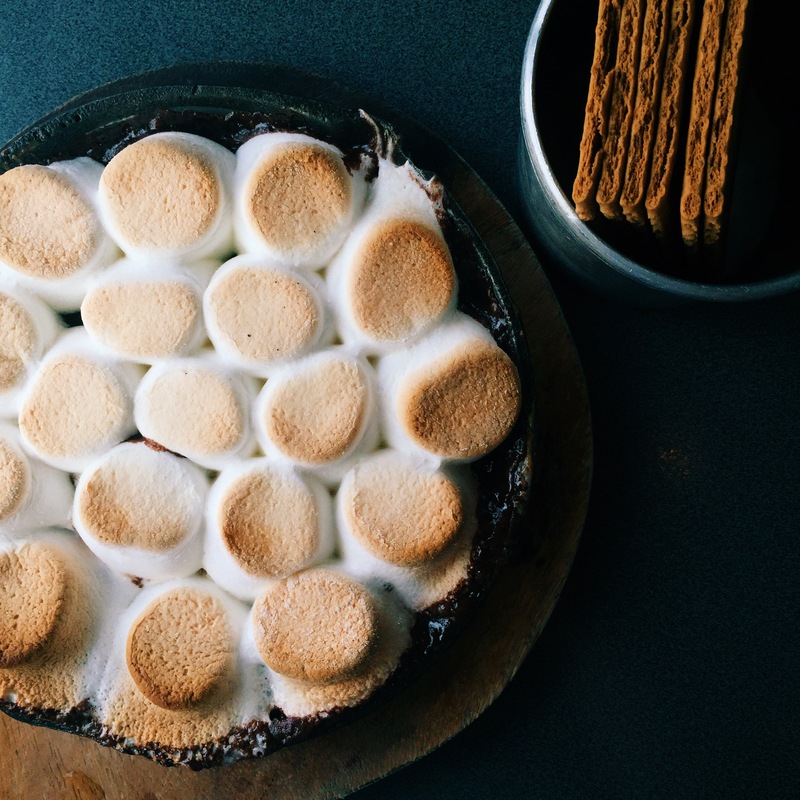 The chocolate under the thick mallows tasted like brownies and just thinking about it now makes me salivate. It is a must try, I tell you! The restaurant’s gluttony was one of the bests as well! We ordered the gluttony single but it is actually good for two. The thick chocolate-chip cookie was a bit hard on the outside but was really soft and chewy inside. 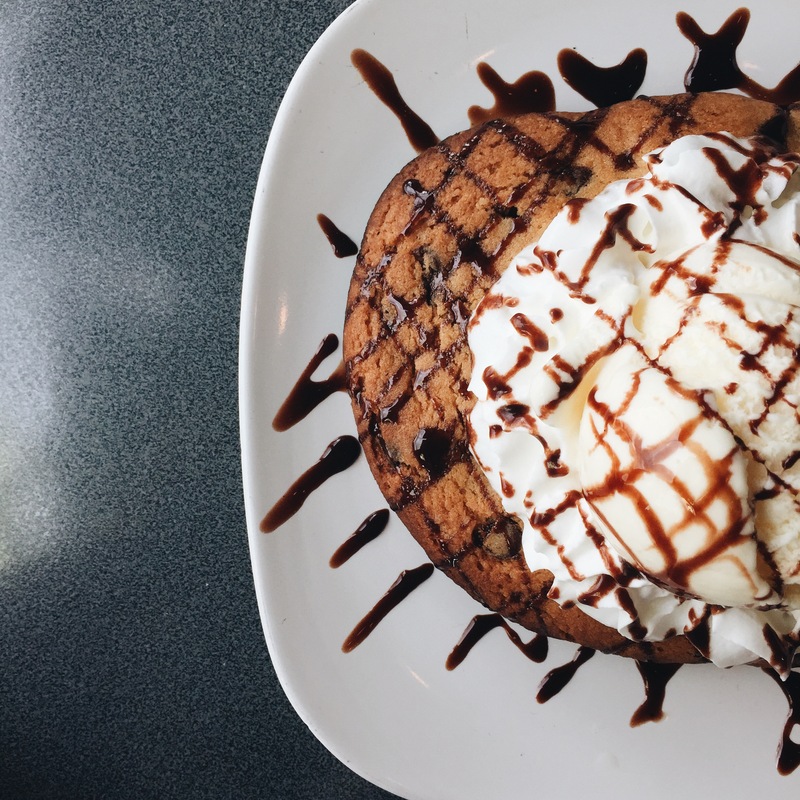 The ice cream topping that tasted like butter and the whipped cream went really well with the scrumptious cookie! It took quite some time for our orders to be served but it was definitely worth it! We are yet to try the other five desserts but we are sure that they are all to die for just like Greed and Gluttony! This hole in the wall is a neighbor of Wicked Kitchen and serves different kinds of cookies. Jason and I happened to drop by this cookie store while waiting for our sundo. Of the six, we actually got to try four. 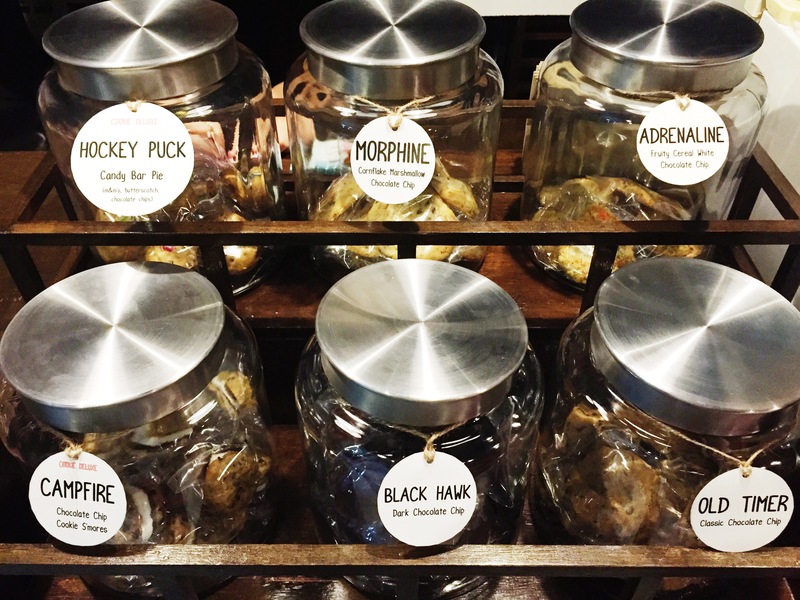 The campfire, morphine, black hawk, and old timer. The campfire was their version of chocolate chip cookie s’mores. It was soft and chewy but kinda crumbly. The morphine was their cornflake marshmallow chocolate chip. I was intrigued as to how the cornflakes would go with the marshmallow so I tried it. The cookie was brittle and kinda hard to chew reason for me to not enjoy it. The black hawk and and the old timer were both delicious but both also crumbled. 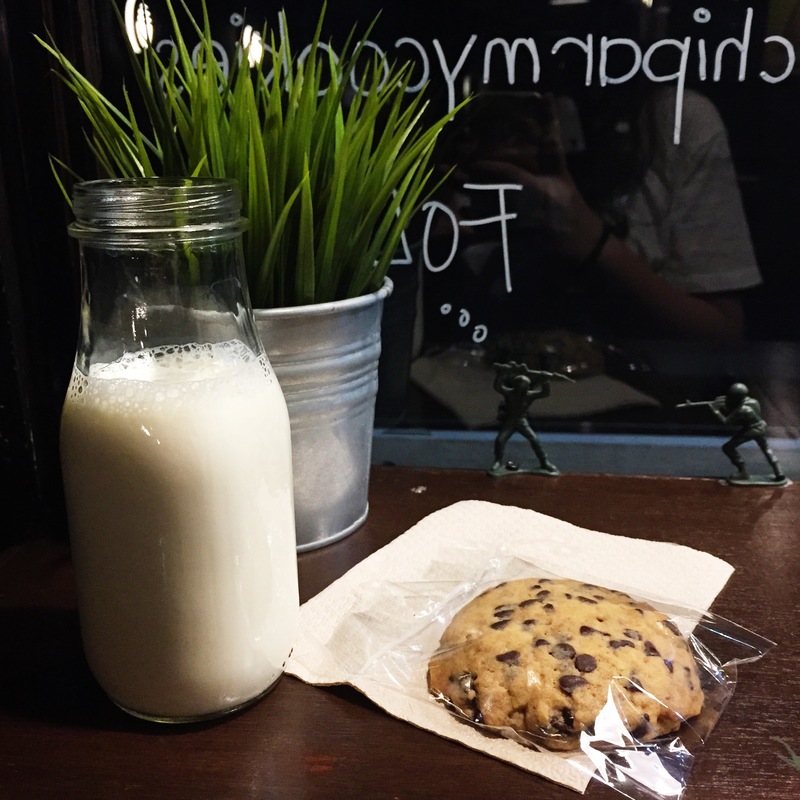 Aside from the cookies, this army-inspired cookie store also serves drinks that would go well with the sweet treats. They also offer cookie cups that could be served with ice cream and ice cream sandwiches. I am pretty sure that cookie lovers out there would find this hidden place heavenly! This has got to be my favorite food place in the block and there are so many reasons why. 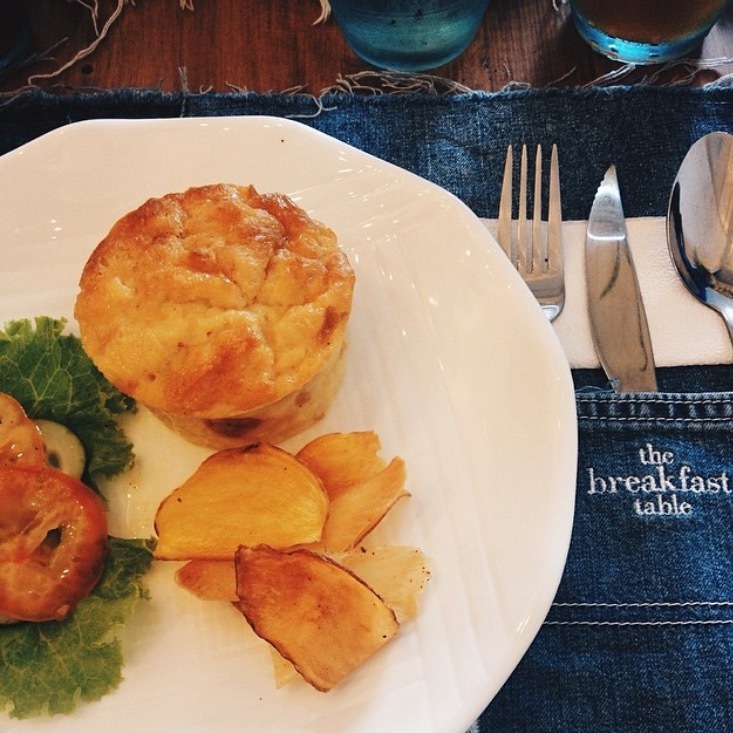 The lovely interior of The Breakfast Table made me fall in love with it immediately. 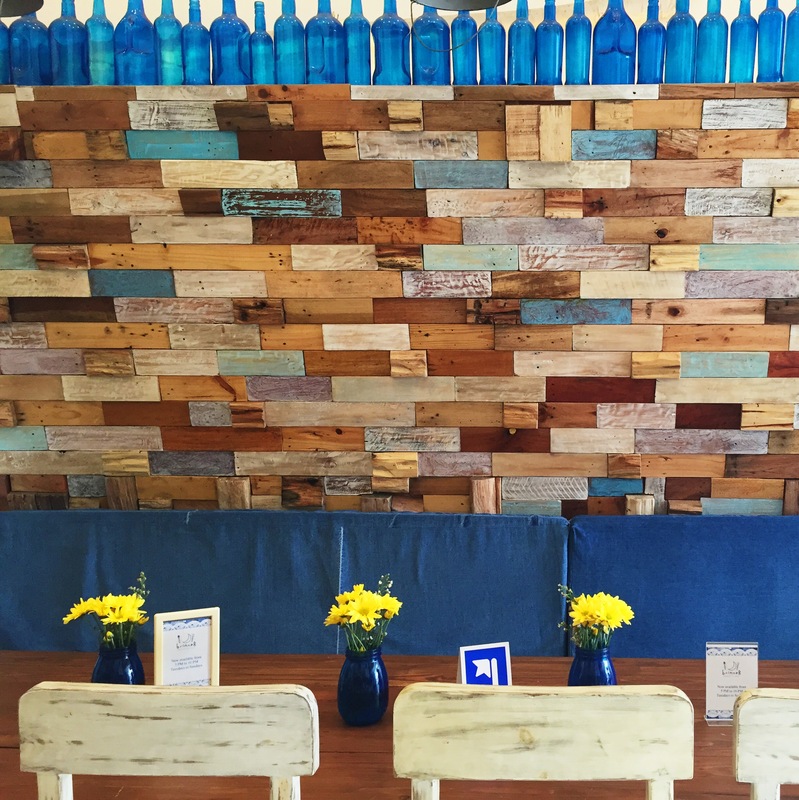 Jason and I have tried this place for a number of times already but the blue and white motif of the place still give off a homey and cool atmosphere that makes me feel so light. 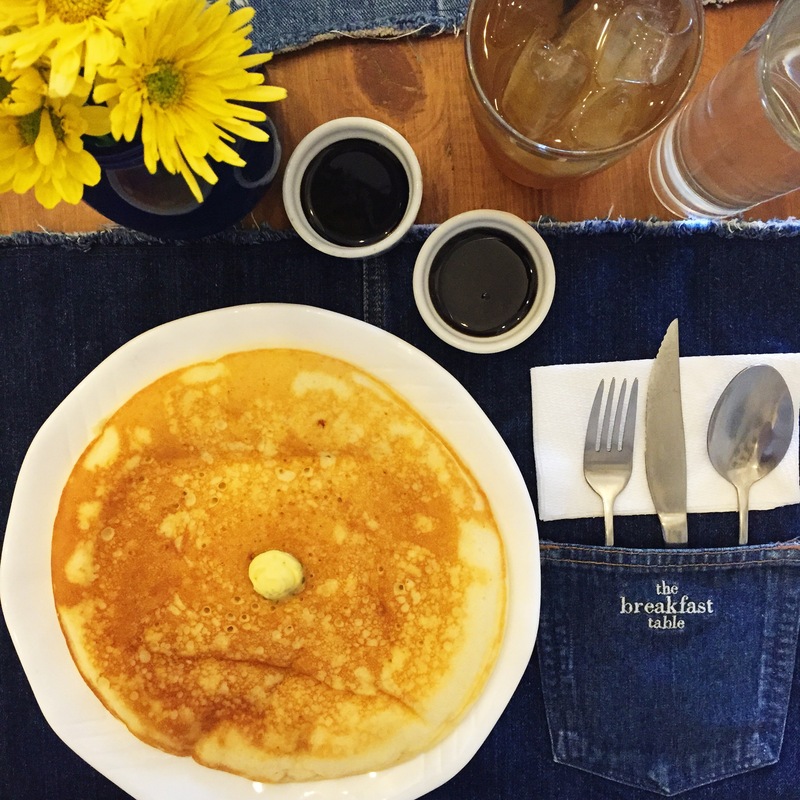 We were able to try their TBT ham and cheese, super pancake, and TBT breakfast basket. The TBT ham and cheese, although small, was very flavorful and satisfying. There were lots of ham and cheese sandwiched between the muffin-like buns and the whole thing tasted sweet with the syrup/sauce added into it. It came with a leafy salad and dried bananas on the side. Another thing Jason and I had the chance to try was their super pancake and trust them when they say super. I think it is equivalent to three pancakes and it came with two kinds of syrup—chocolate syrup and muscovado syrup. The pancake was not bland even without the dayap butter on top because it had banana slices in it. Jason and I also enjoyed feasting on their TBT Breakfast Basket. 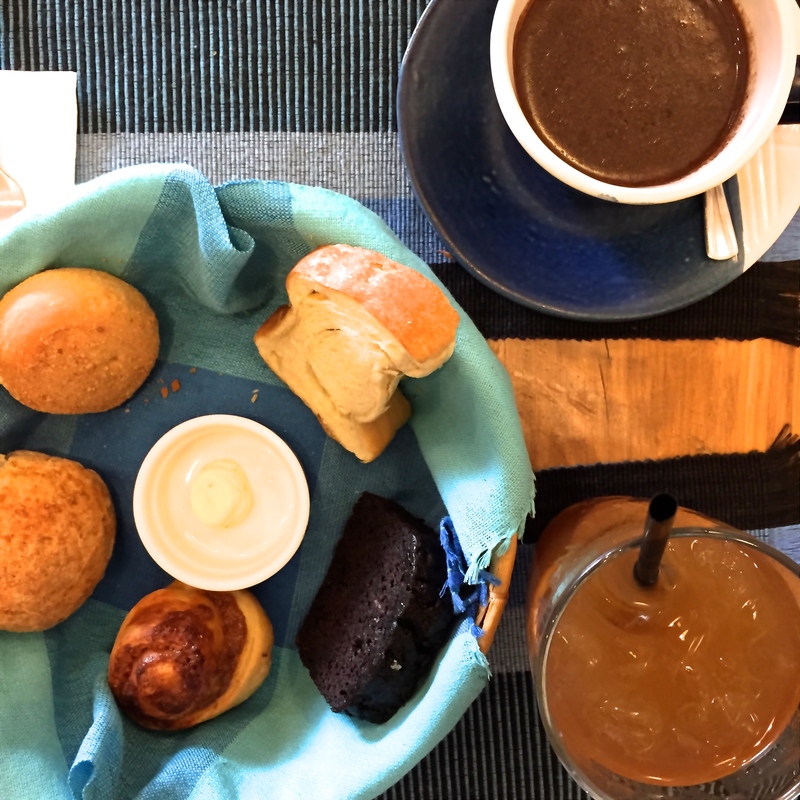 The said basket consists of 5 different kinds of bread—pandesal, honey wheat roll, challah, pan de coco, and chocolate banana slice. The basket of bread went incredibly well with their Papa Diddi’s Hot Chocolate and my forever favorite drink, TBT Cooler.